Half Moon Bay Rotary Club has donated an automated external defibrillator (AED) to Sunnyhills School. An AED is a safe and easy-to-use machine which is used to treat a sudden cardiac arrest. This life saving equipment is located for easy access for any member of the community to use should an emergency arise nearby. 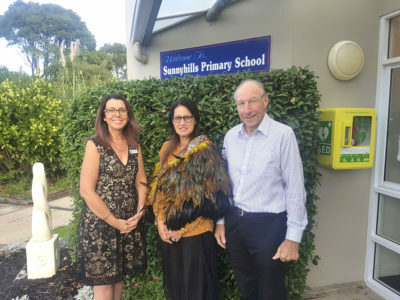 Sunnyhills parent, Lorelle Stranaghan initially contacted the school to consider purchasing an AED especially with the hopes that the school pool will be available during the summer months for families to use in the holidays. However, with limited funds available from the school for such an expensive but worthy resource, Lorelle reached out to Richard Wilkie, a member of the Rotary Club and whose wife Ann was a past pupil of Sunnyhills, as a connection for support.